Adorable dress! I wish I had a few more summer weddings to attend- my favorite part was choosing a dress. That dress is amazing! You look GORGEOUS! Sounds like a perfect wedding! You look gorgeous! adorable!!! love that necklace with your dress!! u look so pretty! lovely dress. You look amazing! I love the flare on the skirt, so feminine and fun! Love this backyard wedding look! You look gorgeous and the dress is lovely. 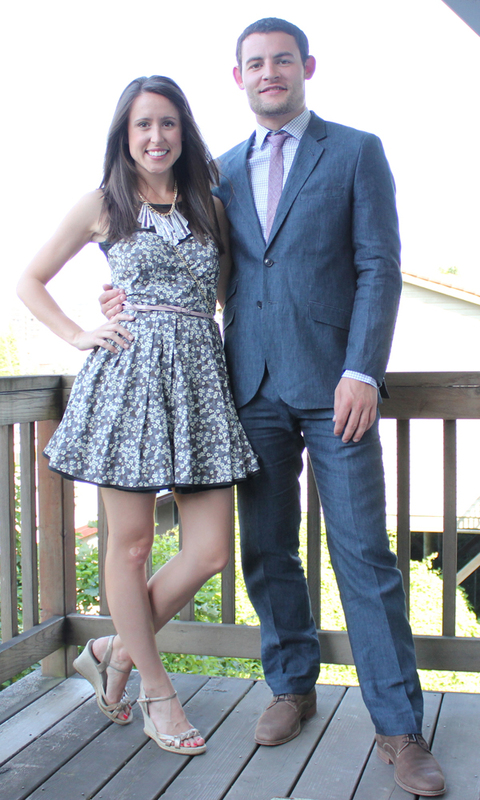 Also, I agree, wedges are a must for outdoor weddings. I have made the mistake of wearing heels and walking like a dork sinking in the ground. This is such a beautiful dress., it fits you perfectly!! Great wedding look Jess! Love the dress! Tooo cute! Loving that dress girl! Especially with the mesh on top! Happy Belated 25th!! i love your dress! soo pretty! Ohh... I love that dress! SO pretty! you look gorgoeus! I love the dress! It's so beautiful and the necklace is a great touch! So glad you had a blast! You guys are too cute! This outfit is the perfect backyard wedding outfit! I always wear a similar outfit to backyard weddings. Wedges are a must in the grass! Cute dress! I'm your newest follower!